Himakshi: Describe us about yourself. What type of person are you, and what are your future goals? Sameer: Ever seen a sponge ball with a smiley on it? Imagine that dipped and well absorbed with water. Well, that’s me- a ball full of emotions, of mine and others, rolling myself well on this canvas of life. I’m not only limited to paper and pen or situations or conditions. I can create art or see art any time and everywhere around me. That’s how I am. I try to help people without any demands, but with expectations that this positive action will carry forward with them, even if it’s for few days, I don’t look at myself in the tags I have been dedicated but only one term ‘warrior’. I used to see the world in only two categories- victims and survivors, but one day, my friend who was trying to console me, said to me, “you are a warrior, warrior of art you can never give up because I know you.” My life changed with that one sentence. I turned into a striver than the person who used to try and give his 100%, achieving gave me satisfaction and not mere trying. Although that friend is no more, depression killed her, but this tag will always be mine to inspire and motivate me to achieve impossibilities because a warrior never rests until the battle ends and my battle has just begun. My future goals are to motivate as many people as I can to live a life they always wanted to live and create awareness among them on how to do it. After this completion of touring 3000 places in India I want to carry forward that idea by touring Asia then maybe the world, I want to give my share of bringing a change in the society. I’m not a philanthropist, neither an entrepreneur; I’m just a human helping human who is learning the same thing he is teaching to others. And lastly, reading and writing more books. Himakshi: Tell us about your book and your inspiration behind writing it. 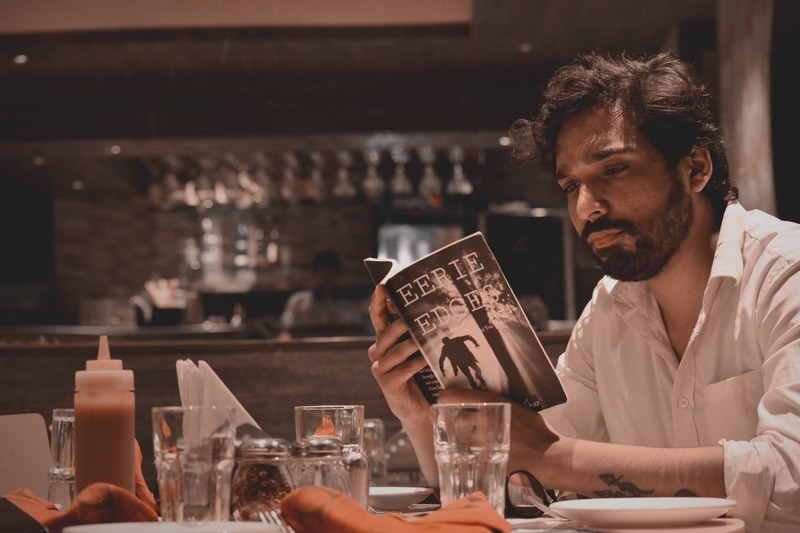 Sameer: ‘Eerie Edges’ is the name of my debut book, it was all about the unexpressed emotions one tends to feel but fails to convey to the loved ones around them or to the world. My only motive to write this book was to be there around those humans I can’t always be. ‘Eerie edges’ is very special to me because I wrote it when my parents were in the hospital and I had to stay up at the canteen of the hospital the whole night or either travel to the other hospital because my parents were in two different hospitals. For initial days, it was very tough for me to cope up with these storms of circumstances calling tornados of emotions. It was destroying everything coming on my way even my thoughts. I became isolated and when my mom started to recover, that one night, I shared that to a stranger sitting next to me, in that dark isolated canteen. He told me about how his life is changed seeing his wife dying slowly and doctors not giving him any hopes. I realized words had the power to give hope and change lives that night. I stated something that gave him hope. He cried- we both actually cried. Next morning, when we crossed paths in the hospital, he passed me a smile and I knew- Words can change a life. It can make one smile so can it heal. I took out my journal and crop the name of ‘bird of pain’ to ‘eerie edges’ because when we tend to feel left out or hurt we reach the corners and isolate ourselves with dark emotions which create those edges eerie. The book is divided into four categories ‘poems’ where I have described the different essence of pain a person feels, with my level of understanding, next section is ‘prose’ because I knew many wouldn’t understand poetry or don’t feel connected to that form of art. I carried forward the brief version of the pain, I described in poems. I was sure this would have made many people cry and I was also sure they would be wondering what’s new here. I added the third section which had quotes on life and on why one feels such pain and how to fight it like a warrior and once they get an understanding about everything it is very important to bury it in a graveyard. The last section is for tiny tales calling it the graveyard of memories and hence, ends my special and debut book ‘eerie edges’. Himakshi: When did you find out that you were made for writing? Sameer: I had been writing since I was very young it kind of came like a disorder in my life, I was unsure about what I’m doing because I had a lot to say. I was an over-talkative person and I had no friends to share it with. Himakshi: What do think about the literary world and what are your expectations for it? Sameer: My literary world is limited to my own thoughts. Art, for me, is not a competition but only a medium through which I express myself best. I don’t want to put boundaries on my thoughts and I hope to explore as much within as I explore without. I believe there are a million galaxies exploding at the pinpoint of human conscience every second and I have taken on the role of a voyager. Himakshi: What are your future plans apart from writing? Sameer: I just wish to surround myself with art until my last dying breath. I was never cut-out for a 9 to 5 job and I feel it more strongly now than ever. There is always a restlessness that comes with being creative in any field, and that holds true even for me. I have never restricted myself to writing alone, and I try my best to expand my horizons and my capabilities in any form I could. Himakshi: What inspires you to keep going in life? Sameer: To see what’s unseen by me. I have wanderlust and I want to travel to places which make you wonder or give you a sense of belonging. Himakshi: What is the message you want to spread among folks with your writings? Sameer: With my writings? It’s simple- to express until your last breath. You never know when it eases that particular pain, regret or incident which is so hard to move on or say, escape from. I believe there’s no problem in this world which we can’t solve, that means the solution definitely lies inside us. How would we know is it there or not if we aren’t exploring our within; and what other way is there to express than writing it down in a space where you and your body can intimate freely with emotions where heart meets brain, present meets past and reality meets metaphors. So that’s the only message I am giving with my writings. Himakshi: What do you do apart from writing? Sameer: I am blessed with many artistic capabilities. Sometimes I sing, sometimes I paint- really anything that soothes the turmoil within me. Himakshi: What is your inspiration and motto behind writing? Sameer: I want others to be able to appreciate art as I have come to. I believe that there is a higher purpose that art fulfills in our lives and we must only have the patience to let it weave its magic around us. Himakshi: Do you have any specific incidence that changed your life? Sameer: There are plenty. I have been blessed with ART since I was a kid but I couldn’t gather the courage to flaunt it, like other kids used to their talents. I guess that one impulsive decision of traveling the whole of India on 24th April 2017, 4:15 am in my room changed my life. I traveled to nearly 3000 places for 1.5 years meeting more than 10,000 people. It was strange- I was getting to know more about my life by knowing about theirs. I realized I get more attached to places than humans. That was an experience for life from traveling via taking lifts from trucks to sitting near washroom in general coach of Indian railways and then entering a place totally stranger to me- walking in those streets, exploring the unexplored. It was indeed beautiful. Himakshi: What importance do a pen and word keep in your life? Sameer: When I was a teenager, I developed this crazy interest in maintaining a journal and that was the year, we were allowed to use the pen. Since then I never used a pen, it was always pencils and sketch pens. My first pen was gifted to me by my dad. It was a Parker. I remember Amitabh Bachchan used to endorse that brand and he was there on my pen. I like the smell of the ink. I got my two best friends a pen and a journal. I used to write all the secrets of the day I used to face in my journal. Yes, it is an important thing in my life because of all the memories and moments it can hold and portray. Himakshi: What are your suggestions to the budding writers that they could improve their writing skills? Sameer: There is a famous quote “practice makes everything perfect”. Keep learning and keep practicing. There are plenty of websites which offers courses in creative writing and they are really effective, but one thing for sure, I would give to budding writers is same as what Charles Bukowski said, “if it’s not bursting out of you, don’t do it!” Never force yourself to write. Be authentic to yourself and express where you feel comfortable. You don’t have to follow the trend while developing your writing style. It’s a learning phase- try to collect as much exposure and experience you can, and you will automatically get to know when you are ready to land into the market and fight these unspoken battles of being the best. Till then, enjoy the journey!